Looks good on men, women & teens. Durable stainless steel ID with white enamel medical emblem is easy to care for. 7.5-inch watch-style band features a secure, fold-over clasp, and is easily sized down by a watch shop or jeweler. Engraving included: 3 lines of 17 characters each. Please see instructions below for customized engraving before shipping, and how to get a FREE gift box. Be safe and look good doing it. The Lynx Shine is the perfect combination of rose gold and textured silver over durable stainless steel. 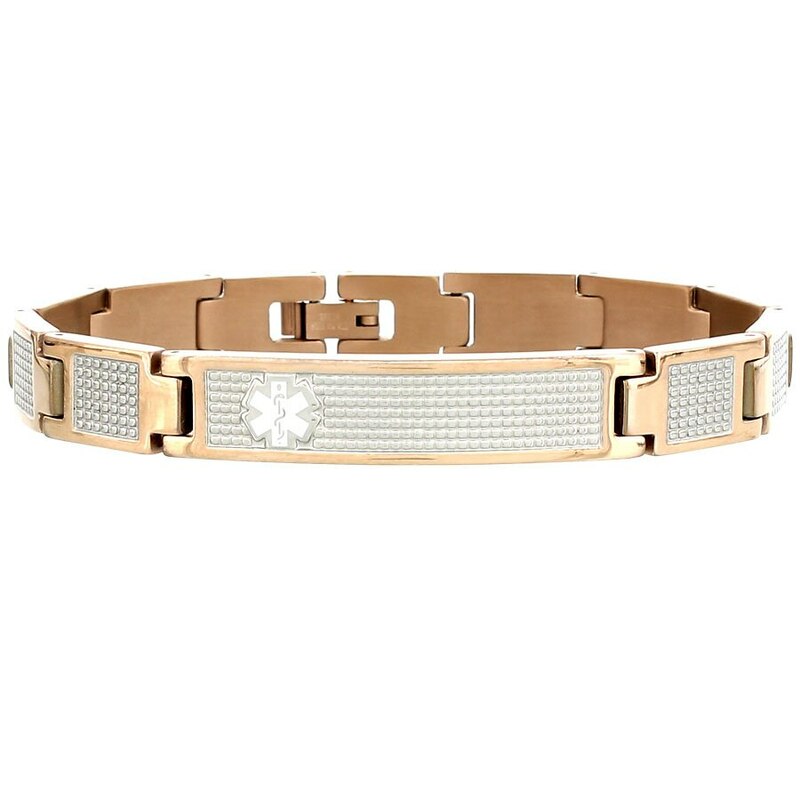 Fold-over clasp securely fastens the medical ID bracelet and links can easily be removed by a watch shop or jeweler for a custom fit. Arrives sized to wear at 7.5 inches. Maximum engraving is three lines, 17 characters each line. To have your ID personalized for FREE, please contact American Medical ID by email or phone, following the directions on the Instructions Tab. To receive a FREE gift box, contact American Medical ID within 48 hours of placing your order. Custom items will ship within 7 days. Email us at WAGSEngraving@AmericanMedical-ID.com with your requested engraving. Please include your order number in the subject of the email. Call us toll free at 1-800-363-5985, M-F, 8 am - 6 pm CST. Please have your order number and desired engraving available. To receive a FREE gift box with your purchase, please submit your custom engraving within 48 hours of placing your order.